WE were at Walmart the other day looking for those 50-pound sacks of Great Value mac & cheese when the twins, Breanna and Brandon, saw the Halloween aisle. Technically, they’re not twins nor even related and they’re a year apart, but the foster agency dropped them off on the same day (and I can only remember so many damn birthdays). I gave her a list of eighty or so clever bon mots, cutting remarks and pithy aphorisms from Dorothy Parker that I pulled off the internet, sent her to the nursery to study them, and told her I’d begin drilling her on them the next morning. Seems the five-year-old bit off more than she could chew – turns out she hasn’t even learned to read yet. 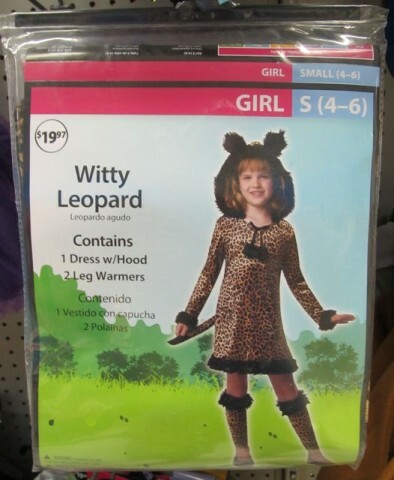 Obviously, there’s no way in hell she could pull off a “witty leopard.” She began crying hysterically despite my assurance she had nothing to worry about, that instead we’d throw a sheet over her with a couple of eyeholes cut out (which was somewhat fitting because that godawful wailing is perfect for a ghost). So guess who gets to go as our witty leopard! Posted by Ted on September 19, 2013, 11:07 PM.